Scotts Travel: It's our 80th Birthday, here's a bit of history for you. It's our 80th Birthday, here's a bit of history for you. You may be surprised to know that we have been trading for over 80 years from our shop in Southgate. And that's why we love helping our clients book their dream holiday, securing the best seats, rooms and experiences to ensure that every holiday is as unique as you. In 1935 Peter Scott opened for business as a Travel Agent at 3, Broadway, Southgate, London, N14 under the trading name of SCOTT'S TRAVEL BUREAU. This was long before the age of mass travel/tourism and its main business was the sale of rail and coach tickets and as local agents for Cunard White Star, (to USA), Union Castle Line (to South Africa), P&O (to Australia) and other main shipping companies. In 1960, when international travel/tourism was beginning to take off, and with the advent of package holidays, the business was purchased by David Roberts, a young Chartered Accountant living locally, who owned a shipping business in The City. He rapidly added the coveted International Air Travel License (IATA), in those days difficult to obtain, and Scott's became a founder member of The Association of British Travel Agents (ABTA), now recognised as the professional body representing the main travel trade in the UK. In 2004 a government ATOL license was added to conform with legislation necessary to protect the public from financial loss due to the collapse of airlines/tour operators, although it is the proud boast of Scott's that they had always refunded from their own resources any loss suffered by clients who had booked through them. The business flourished under its Managing Director, Tom Satchell, for thirty years until his retirement in 1995 when Lloyd Collier and Michael Prior were appointed Executive Directors. Both had joined Scott's on leaving high school and gained invaluable experience at the sharp end of retail travel over twenty years, particularly in computer technology which now dominates booking systems. They are backed up by a team of well travelled experienced consultants who have been with the firm for many years. 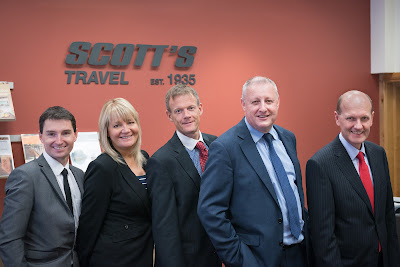 SCOTTS TRAVEL (LONDON) LTD offer a high degree of efficiency, security and personal service seldom matched by other retail travel agents, and this reputation has spread far beyond the immediate locality so that their blue chip client base now spreads not only across the UK but also internationally, and is increasing annually despite strong competition from direct marketing and the internet. Your dream holiday starts here at Scott’s Travel, your World Wide luxury travel specialist. Contact a member of our team on 020 8882 0141.